Your spikes look good, but I really like the tool you created to keep them all at the same depth, that was pretty good idea you have there. Mike: That anchor is is a display model all by itself. Finding a way to fit those spikes consistently will make all the difference to the finished appearance of your deck. What does that character say? you really made some progress on this build! the rigging....the flag.....some very nice work there. I was wondering when you were going to do the spikes....very.....very nice work! Thanks for the comments, guys. Arthur, the character on the flag is supposed to be a Chinese character for "turtle". It is the same as the character on the flag of the replica in Seoul. I can't verify that that is it's correct meaning-- it's not the same as the Japanese kanji for "turtle" in my dictionary, and Japanese uses Chinese characters for the most part, but there are only about 6,000 characters in common use in Japanese in addition to a phonetic "alphabet", whereas I believe Chinese has something like 40,000 characters, but no phonetic alphabet. And Korean is altogether different. To break up the tedium of making the spikes, I decided to begin installing those I have finished. The installation goes quickly compared to fabricating the spikes. I started at midship so I could define the unspiked pathways around the hatches. I've got not quite 2/3 of the spikes made now, and about 1/3 of the spikes installed. Thanks for the language lesson, I guess I'll just have to take your word for it. I don't think my OCR program will be able to cope with it! That hull looks absolutely fabulous with those spikes fitted! the spikes look real good.....nice! Thanks for the comments, guys, and thanks to everyone who looked in. 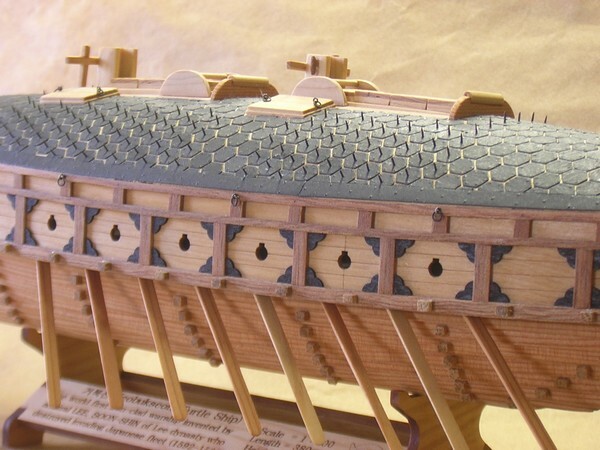 The turtle ship is finished now, and I've posted pics in the completed models section. Hi Don, because of the way the plates overlap each other, you're not going to have a nice glue line. Rather, you're going to need something that is gap-filling, and somewhat flexible I would think, and that allows repositioning, but grabs well. One glue I've used in such situations is E6000. It's readily available at craft and hardware stores. It's a thick, gummy glue, and is good for gluing dissimilar materials that don't have a precise fit. 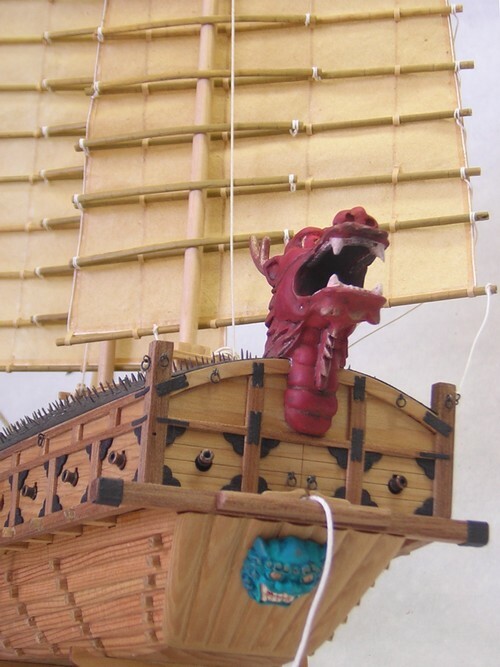 I used it to attach the dragon's head to my turtle ship.